Melissa was brilliant. Punctual. Organized and knowledgeable. She was also fun and made sure also to take care of our 6 year old daughter too and make sure that the tour was interesting for her too. Melissa is a delightful young lady and an excellent guide. Having been to Kuala Lumpur with Melissa before we asked her to do a special tour to show us the more rural Malaysia which she did. We had a great day and thank her for all the work she put into our day. Mélissa was a great guide. Very interesting tour. She knows every detail about the history of Malacca as well as of Malaysia in general. Very kind and helpful person. We highly recommend her. Melissa was fantastic! 5 star rating. Highly recommend. We have used Tours By Locals in over Ten countries in the past four years and always had outstanding tours. However yesterday's tour by Melissa was the best day we have ever had. She was incredible. She was timely and during the long drive into Kuala Lumpur she was extremely informative. Her English is excellent with an impressive vocabulary. She took us to excellent stops and kept us enthusiastic all day despite the heat. Although we had been to KL twice before she hardly repeated anything we had seen. Melissa was very knowledgeable, answered every question we could come up with, and really made the afternoon interesting and enjoyable. Will look her up again if I ever get to come back to Kuala Lumpur. Having never done a tour before I was skeptical, but Melissa's knowledge of her country, city, as well as history and politics, made the whole experience truly worthwhile. She provided an understanding of the country in a way that a tourist wandering around would never truly grasp as well as the best areas to check out when exploring the city to get a better insight of the local culture and the most popular areas for tourist. I would highly recommend at least one tour with her to my friends visiting KL. Melissa is an excellent guide. She was very informative and friendly. I would recommend her whole heartedly. On our second day with Melissa we took a day trip from KL to Melaka. As already mentioned, Melissa is a great guide. She chose a wonderful driver to take us to Melaka, and even though we were in the car a long time, my wife and I were comfortable and the time passed quickly because of lively conversation with Melissa. Melaka has a very interesting history, and we learned a lot from Melissa and also had fun in a little bar that seemed frozen in time from a century ago. The KL Heritage Tour was the first of a two-day experience with Melissa. She is an excellent guide. She possesses a wealth of information about Malaysian history and culture. She also has a nice personality and is a pleasure to spend time with. And she seems to have an uncanny ability to read people and know how to give them what they want from a tour. I strongly recommend Melissa and would seek her out again on my next visit to Malaysia. It was an excellent tour, focused exactly on my specific requirements. Melissa was very flexible with my schedule and I have very much enjoyed the time spent together. Thanks! Melissa was awesome! We had a layover in KL and weren't sure where to start, Melissa met us at the train station and from beginning to end was so knowledgeable, friendly and interesting! I knew nothing about KL and Melissa gave us a comprehensive overview of the history of KL as well as giving us insight into the city in the 21st century. We went on a canopy walk, for a delicious local meal, all the sites you could possibly want to visit. Cannot recommend Mel enough we were thrilled with our tour. Thanks! My travel mate and I were in a Kuala Lumpur for a first time visit with limited time. We connected with Melissa and, wow! She was able to construct a fantastic itinerary based on our interests and both of us couldn't be more pleased. Her knowledge of all the facets of a city - far beyond pointing out landmarks - was without question amazing, entertaining and relevant. And...she is one wonderful person. I've visited soon 100 countries and am retired airline executive, so I know a thing or two about travel. We were very happy with Melissa. She speaks excellent English, is friendly, flexible and explains things very well. As we toured, we felt comfortable to ask her any (and many) questions. We weren't in Kuala Lumpur for very long, but felt like we packed a lot in and was able to cover way more ground than if we hadn't had the tour. Melissa went over and beyond our expectations and we couldn't have been happier with our tour. We had a wonderful trip and Melissa was so helpful in working with the energy and intensity of my active 7 year old. We saw so many things that we wouldn't have found by ourselves and had a wonderful last day in Malaysia. I had two private tours with Melissa. She was punctual, always friendly and brought me to all the places which we had planned. She was well organised with transportation. Most of all, she is VERY KNOWLEDGEABLE. The tours have been highly interesting and I learned a lot. I can recommend Melissa without any reservation. Melissa took us on a great tour which included some amazing food and a visit at two wonderful temples! The food we tasted had a wide range of variety, suitable for everyones tastes. She has great knowledge of local history & culture, telling us some amazing facts and stories! Melissa guided us expertly through the Petaling Street with ease, always making us feel comfortable and engaged. She is an amazing guide and person! If you book with her, you will not be disappointed! Melissa was knowledgeable and fun. We all had a great time with her and she took extra care to help our nearly blind mother around. Melissa was fantastic - knowledgeable, accommodating, friendly, and spoke perfect English. There were 8 of us and the vehicle was great and she gave us the best possible tour. As a travel agent who was personally on this tour, I cannot say enough good things about her qualifications. Melissa is a gem! Her patience, wisdom, enthusiasm and generosity of spirit is breathtaking. Grab this gal if she's available! Melissa is an extraordinary guide! Knowledgeable, personable, thoughtful, caring, flexible,& organized, she is one of the top guides we have ever had in our tours of 78 countries! She provided everything listed& more. Her bubbly personality, abundance of information, positive energy, & photography skills added up to a great day! The clean air conditioned very roomy van & excellent driver, & cold bottled water also contributed to our wonderful day with Melissa. Don't hesitate to hire her. Highly recommend! We had a fantastic tour with Melissa. She is a very enthusiastic and knowledgable person and transmits it to her group, in a perfect English. She has the ability to give many historical and cultural informations without the tour becoming "heavy". Even our 3 teenagers enjoyed very much our 3 hours Heritage Trail tour with Melissa, which definitely is a challenge;-). Melissa took care of everything during our trip. She also provided a thorough info about Malaysia. it is an enjoyable experience to listen to her. it is excellent to have a guide like her to accompany with. Melissa was great and really tailored the tour for our group and my 79 year old mom. Her knowledge and clear communication made it a very memorable two day tour- Highly recommend Melissa ! Melissa was prompt, knowledgeable and took us on a great walk through the history of KL. Highly recommend her to other travelers. Melissa has been an exceptional guide. She is very knowledgeable of the history of kuala lumpur. It had been a smooth and easy tour. She went beyond her duties as a tour guide. She was easygoing and helpful specially with pointing out the best spot for photo op. I will Definitely recommend her. Melissa is a wonderful guide. I've been on trips with probably 10 or so different guides and she is in the top three. Great stories, easy going, made a rainy walk through Kuala Lumpur an adventure I'll remember. Melissa is FANTASTIC! Smart, professional, a pure pleasure to have as our group guide. Thank you! Melissa is a wonderful guide. She cares a lot about the visitor and explain everything with detail and passion. She has prepared an special tour for me picking me up in my hotel and taking me to the best places of Kuala Lumpur. I have seen aprox. 60% of things that worth seeing here and she returned me to the hotel. She took me also to get some things that I wanted to buy. She is very well educated and her English is perfect, so conversation was fluent during the whole tour. Brilliant and informative trip for both adults and children in my group. Our group of 4 were enthusiastically unaminous in agreeing that Melissa's service on the tour exceeded our expectations. We were enchanted by her excellent story telling, her explanations of heritage and history, and her depth of knowledge of such a fascinating place. Melissa was readily able to exceed her brief and provide us with additional insight and understanding of the history, culture, religion and practices of Malaysia and Melaka. A rich experience made possible by an authentic Melakan. Melissa is a very friendly and kbowledgeable guide that gave us an outstanding tour of Malacca! Definitely one if the highlights of our trip. A very good tour with an experienced, thoughtful guide. Melissa was good at planning an interesting day and having a van was very comfortable to dip in and out of as we toured the sights. Always informative and ready to answer any questions, Melissa was very knowledgeable and is highly recommended. Exceptionally good. In my over 50 years of travelling I have never found a guide so competent,dedicated and cooperative. Her knowledge of her country history, customs, economy and daily life is impressive. Her english language knowledge and control is coutstanding. Mellissa did a wonderful job leading us and having us experience the unique things, sights, food and culture. Her knowledge of this location was complete, she was articulate has a wonderful personality. She was truly interested in our needs and feelings. Was a complete pleasure to work with her. Wow, Melissa was a great guide. We had wanted a cultural and historical overview of Kuala Lumpur and that is certainly what we got with Melissa. She has clearly poured her heart into having a wide understanding of culture and being well read and informed. She also made some excellent recommendations on what we could do after our tour and we thoroughly enjoyed them. We did a customized Malacca walking tour with Melissa and it was WONDERFUL!! We learned so much about the history of Malacca, Malaysian culture, Buddhism and more. Melissa was extremely knowledgable, friendly and accommodating. The middle of the tour was capped off with a wonderful cool treat in a local tea house. We highly recommend Melissa for any tour. She made our trip truly memorable. Thank you Melissa! Absolutely the best guide we have had you seeing tours by locals in two years ! Professional, perfect English, wonderful knowledge of history and analogies two locations in the United States and abroad We will remember KL and Melissa fondly. Our guide, Melissa, was so knowledgeable about the various cultures and religions in Malaysia and their influence on Kuala Lumpur. She is clearly passionate about history as well as the plans for the future of Kuala Lumpur and was eager to share it with us. What a wonderful experience! we had Melissa as our guide in both KL and Malacca. She was an extremely knowledgeable guide and made our days in both ports enjoyable and informative. We learned a great deal from her and saw everything we had on our itinerary. Thank you Melissa. Great tour. Thank you Melissa - well done! Melissa was amazing! We weren't sure what to expect from KL but she was so informative and engaging. The kids were less than enthusiastic to tour but loved Melissa's trivia which made the day fun. We also went through a great market and had a lovely meal with Melissa's guidance and she went out of her way to get us some local fruit to try. We would visit with Melissa anytime as she's one of the best tour guides we've ever had! Melissa's knowledge of the city was amazing. The way she linked the rout and stories was amazing. I highly recommend Melissa as a tour guide. 10 super big gold stars! Melissa is the best tour guide I have ever experienced. I would give her an A Plus. She is smart, knowledgeable, flexible and has a great sense of humor. Excellent! Excellent Guide. English is her first language. Very knowledgeable. Good pace. I highly recommend her. Amazing experience and perfect tourist guide I'm very satisfied with my tour I had only 1 day and I was able to make the most out of it Melissa is very capable and extremely passionate. She was able to satisfy my curiosity giving me all the information I needed and answering to all my questions 5 stars! We had a great tour with Melissa in KL. She met us at the cruise terminal promptly. the van was air conditioned and comfortable. Melissa spoke perfect English and was happy to impart information to us. We were shown the sights and were returned to the ship in plenty of time for departure. If we go to KL again then I would be looking to use Melissa again. Melissa was very knowledgeable, enthusiastic and easy to get on with. The pace of the tour was just right and Melissa took time to listen to us and make sure we were happy as well as imparting her knowledge. 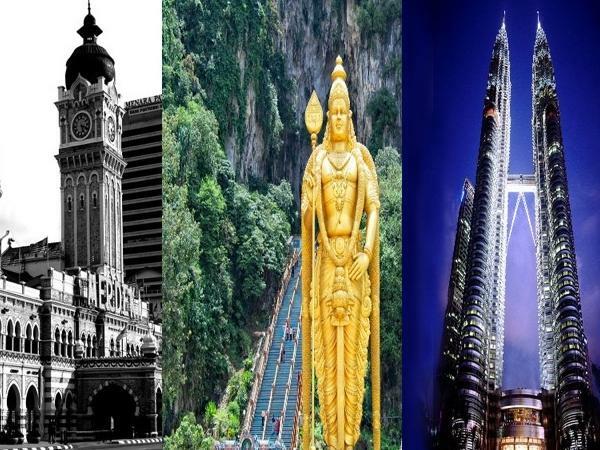 We would definitely recommend Melissa to anyone wanting to discover KL or Malacca. Very knowledgeable, experienced, personable, and fluent in English. Melissa was accommodating and flexible and ensured I saw as much (or indeed as little) of Kuala Lumpur during my layover as I wished and in comfort too. I flew in at an ungodly hour and she was willing to meet me in the early morning. This was my 6th Toursbylocals tour and easily one of the best. Highly recommended. I've done about 10 guided tours (some not with TBL). Melissa is probably the best I have worked with. Her topical knowledge is deep, wide and represents an investment of personal time in pursuit of topical mastery. Furthermore, she is incredibly adapt at communicating. For some guides the accent makes communicating challenging, Melissa's accent is charming (she was raised speaking English). Finally, she is great with kids. We did a tour of Kuala Lumpur with Melissa Lua today. There were 6 of us and Melissa was superb! She was on the dock as soon as we got cleared to leave the ship. The van she used was very comfortable for all of us and the driver was excellent. She had arranged everything from even making sure we had access to washrooms along the way. You really want to keep this guide! She's worth a 10 out of 10!!! Melissa does a great job. Prompt, professional and flexible. We would be happy to book her again. Had a great tour and used her service twice, she went out of her way to help us, would repeat again. Thanks so much for being our guide in Kuala Lumpur. Through your knowledge and your excellent command in English, you managed to fill us with as much information about the city as we wished. You've got such a pleasant personality and I wish you all the very best in your career. You truly deserve it! My thanks also go to Tours By Locals for making it possible for us to meet Melissa. All the best Maria. Melissa is terrific! Young, enthusiastic, extremely knowledgeable about the history, culture and politics of Malaysia, she is also a native English speaker which is a huge advantage. My 22-year-old daughter and I spent two days with Melissa: one day touring KL and a second day in Melaka, which is her home town. We came away with a real understanding of this fascinating and complicated country. We are experienced travelers, and she has our highest recommendation. I got a transport service from ToursByLocals. Melissa was very accommodating in fixing our transportation arrangement. The only down side I saw in our tour was it was expensive compared to other tour agents. We could have saved a lot of money if we booked elsewhere. Outstanding tour guide! Unqualified recommendation. She is smart, fun, personable, and informative. She was very interested in customizing the tour to my wants and needs. I can't imagine a better tour or tour guide. Thanks, Melissa. Melissa is both knowledgable and a pleasure to tour with. She is genuinely interested in what she is doing and we enjoyed our afternoon together very much. We had a wonderful day with Melissa in Kuala Lumpur. It was a very full itinerary but we managed to see everything promised. Melissa was extremely knowledgable and had a good sense of humour. We really enjoyed the way she shared some of her own life with us. Our bus was very comfortable and the driver very competent. There were 16 of us, and all agreed it was one of the best excursions we had done. Thank you for looking after us so well. We had a most enjoyable and informative walking tour with Melissa in Malacca. Everything went exactly as described and our morning half day walking tour gave us a both a great overview of Malacca and a sound introduction to Malaysia in general. Melissa has the great gift of being able to present a wealth of information in an easygoing and conversational (as opposed to class lecture) style. Our only regret was that we had made other arrangements in Kuala Lumpur! Melissa was the perfect guide. She was very knowledgeable and imparted a lot of information about Kuaa Lumpur. She made the figures of the Hindu gods in the Batu Caves come alive with her rich stories about them. She was very patient and accommodating with my elderly parents who were unable to move as fast as we did. She took us to a really good restaurant that was very reasonably priced. Our trip to KL was very memorable, thanks to Melissa. We highly recommend Melissa as a guide in Kuala Lumpur! We have been lucky to meet some excellent guides through Tours by Locals but Melissa exceeded all our expectations. She has a lovely bubbly personality and an enthusiam which is infectious. We asked her to collect us from our cruise ship at port Klang, fit in an extensive tour of Kuala Lumpur and then drop us at the airport for our return flight. We had a wonderful day and, even though we met her for that short time, felt that we had been shown round Kula Lumpur by a friend. Highly Recommended! Excellent tour and 10 star tour guide!! We learned a lot about Kuala Lumpur. Melissa was well informed and very articulate. She was able to bring everything into perspective and brought out information specific to her guests from US and Australia. Thank you Melissa for a great day! Melissa was terrific; knowledgeable, enthusiastic, speaks great English, no problem customizing our itinerary. I would rate her 5/5 stars! Our group of 6 touring off a cruise ship were impressed with Melissa immediately. Her American English is impeccable. She was friendly, well informed and willing to answer all of our questions. She was also very flexible. We loved Kuala Lumpur because of Melissa and what she showed us. I highly recommend her!!!!! Melissa was the best tour guide we had in years. She was so informative and explained all about Kuala Lumpar and Malaysia's history, culture and what it's like living there. She guided us through our stops at the Batu Caves, Independence Square, Central Market, Chinese Temple and the Petronas Towers. She did everything in her power to keep us on schedule and we got to see everything on our itinerary getting back to the ship in plenty of time. Melissa was great! Melissa was an excellent tour guide, she was able to schedule a tour with us on a very short notice, was very easy to communicate to prior the tour. During the tour Melissa was very knowledgable, entertaining, accommodating to all our needs. We ended up having a great day walking around Malacca, learning a lot about past and present of the city while having a very pleasant friendly chat. Would love to recommend Melissa to everyone looking for a tour in Malacca. Very good English! Melissa was the smartest, quickest, most knowledgable guide I've ever seen, throw in some humour and you have the full package. If you are going to Malaysia and need or want a guide, Melissa is it. Melissa did an absolutely superb job, with 3 of the 4 guests peppering her constantly for about 4 hours with questions about history, geography, sociology, religion, politics, gastronomy.....she handled all with aplomb, grace and style. Melissa was handicapped by our late start and early departure due to an illness. In the brief time we had together it was clear that she is excellent at her job and has knowledge of the city and country that is backed up with a solid education. Add a delightful personality and you have a tour guide that would satisfy the most demanding. Melissa is hands-down the best guide we have ever used through ANY tour agency, including Tours by Locals, which have never disappointed. She is smart, totally proficient in English, charming and accommodating. She grew up in a home where her parents insisted English be spoken and also spent 5 months working and traveling in the U.S. We were a group of three couples who have arranged private tours as we cruised from Mumbai to Singapore for 18 days. Each of us was delighted with Melissa. 6 stars! Melissa is an excellent guide with an extensive knowledge of Malacca's history which she delivered to our group in an interesting way. Our tour was for four hours and we covered the main historical sites of Malacca and Melissa always kept the tour interesting. Our group was made up of people over 55 and it was a hot day and Melissa took great care of the group making sure we were comfortable. Melissa also suggested places for us to eat. Melissa is highly recommended as a local guide. An excellent tour. Melissa was incredibly knowledgable in the history of Malaysia and was able to successfully enlighten me to numerous important sites critical to the development and culture of Kuala Lumpur. She has excellent photo ideas and was thorough and articulate in her explanations. Melissa was an excellent and patient local guide of Malacca's historical sites. Although it was a blisteringly hot day, we found her commentary to be very interesting and she followed the pace set by our group. Keep up the good work!